In 1968, when Stanley Kubrick was asked to comment on the metaphysical significance of 2001: A Space Odyssey, he replied: "It's not a message I ever intended to convey in words. 2001 is a nonverbal experience... I tried to create a visual experience, one that directly penetrates the subconscious with an emotional and philosophic content." 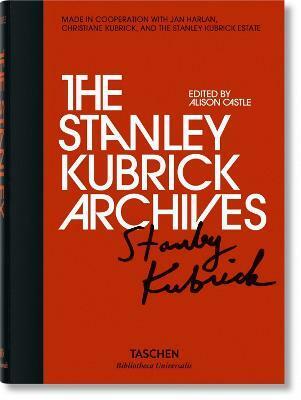 Now available as part of our Bibliotheca Universalis series, The Stanley Kubrick Archives borrows from the director's philosophy. From the opening sequence of Killer's Kiss to the final frames of Eyes Wide Shut, it allows the masterful visuals of Kubrick's films to impress through a sequence of compelling, mesmerizing stills. We uncover Kubrick's creative process through fascinating archival material, including set designs, sketches, correspondence, documents, screenplays, drafts, notes, and shooting schedules. Accompanying the visual and archival material are essays by noted Kubrick scholars, articles written by and about Kubrick, and a selection of Kubrick's best interviews. The result is a visual, archival, and scholarly journey through masterworks of 20th-century cinema and the meticulous mind of the director behind them. "A spectacular book that brings together a selection from the cult director's archives and highlights his relentless pursuit of perfection." Alison Castle received a BA in philosophy from Columbia University and an MA in photography and film from New York University (NYU/International Center of Photography masters program). She is the editor of titles on photography, film, and design, including Some Like it Hot, The Stanley Kubrick Archives, Linda McCartney: Life in Photographs, and Marc Newson: Works.